I have been sent this great old photograph of a Garrett 4CD Tractor owned by John Sadd and Sons who were Timber Merchants of Maldon, Essex. 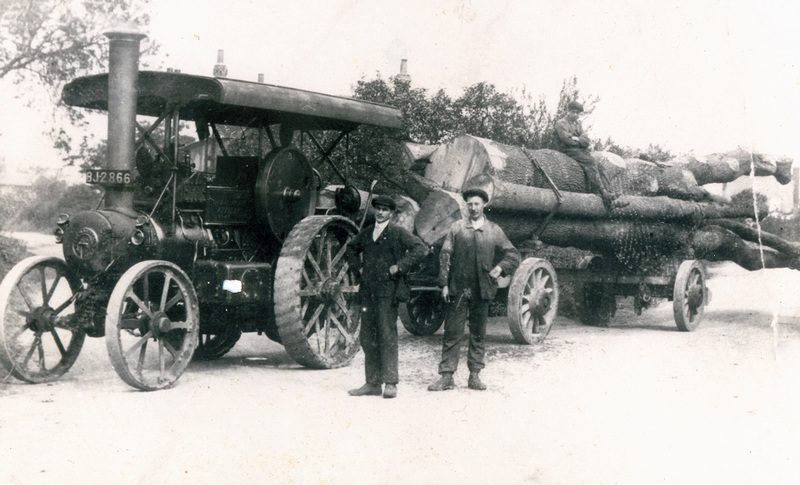 The engine was employed to haul timber from the forest surrounding Thetford, Suffolk to Maldon for sale within the business. The engine hasn't survived and I don't have a works number for the engine, if somebody knows this please drop me a message. Did John Sadd own any other engines? Any further information gratefully received. The Garrett was new to the Witham Cartage and Coal Co., Witham Essex. It is works no. 32809 delivered 27/11/1915. I don't know when Sadds obtained it. Maybe you can help i was led to believe that the Foden timber tractor Little Lady SN 13444 Reg VX 1440 was once owned by Sydenhams Timber Co. Just after the war. i have a cutting from a magazine that tells the story. as i am writing a book on the history of Sydenhams it would be nice to find out the truth. Interesting seeing all these old photos people put online of the Firm. My husbands name is Marty Sadd. He is the grandson of Harry William Sadd of Maldon. I was wondering if maybe the Essex Record office might have some information on the Garrett tractors. They have a huge amount of information on John Sadd and Sons. I have been seen the great tractor on the photograph that I got after open this article this was amazing to get this. I need to know about the technology of this that I got from papers writing service this has all the techniques and information about the old stuff like we saw in this pictures. a really interesting photograph. You might find that Leiston Long Shop Museum, Leiston, Suffolk has information/records relating to Garret engines. I think that this was the original Garret Works that produced the engines.